Ask fellow campers about "Lake Colorado City State Park" and nearby attractions. LOVED, LOVED, LOVED this park! We spent one night here on our way from Michigan to Arizona. It was a cold night, but the restroom was heated, and the shower, albeit rustic, was clean and spacious. We loved the scenery and listening to the coyotes at night. We would have loved spending another night or two here! It was a few miles off the freeway, but the roads were paved and in good condition. All the interior roads were asphalt, and our site was a very large pull-through. We camped at Lake Colorado City State Park in a Motorhome. This campground is 5 miles off I-20. Good paved interior roads and spacious sites, some pull-throughs and some back-ins. Our site (#41) was a long, gravel, pull-through with a lake view, and a covered picnic table. We had to do some leveling, but most sites appeared to be fairly level. We would stay here again. 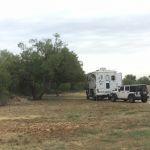 We camped at Lake Colorado City State Park in a Fifth Wheel. This park has large spaces and although its showing its age, everything worked fine and we were one of only a few campers in the park. Verizon and ATT both worked well. There is a hiking path that we took advantage of as well. It was only about 5 miles from the main interstate so it worked fine as an overnight spot. We elected to pay $2 extra for a pull thru so we didnt have to disconnect. The site was long enough and reasonably level. The campground roads we open and easy to navigate. We camped at Lake Colorado City State Park in a Truck Camper. This is a decent state park located an hour west of Abilene. It's an older park that was probably once well used, but now is reminiscent of a ghost town. 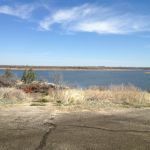 Lake Colorado City is very low due to years of drought and has suffered with severe golden algae blooms which have killed the fish, and therefore has not been restocked. There is no access to the water except at the boat ramp and fishing dock. There are 125 water/electric sites (no sewer) spread out over three camping loops (78 sites have 50 amp hookup). Currently, you can only reserve a spot in one of the loops but beginning in December you will be able to reserve a specific site. We stayed in site 45, a pull through with nice water views in the Rolling Hills loop. There are only 8 pull throughs in this loop, and the remaining sites are back-ins but all are quite spacious. Each site has a covered concrete patio and picnic table which provides much needed shade. There is also a fire ring at each site (although ours wasn't cleaned before we arrived). Sites seem to be fairly level (you may need a leveling block or two) and are comprised of an asphalt/gravel mix. Interior roads are good and easy to navigate. Double dump station easily accessed from both directions. Park terrain is very dry, with lots of prickly pear cactus and mesquite trees. We saw lots of rabbits and prairie dogs. Bathroom/shower area was dated but fairly clean and consisted of three toilets and two showers per gender. Verizon signal was good, but no usable OTA channels. No laundry facilities either. Good signage to the park. Park was very quiet and peaceful, with only a handful of other campers during our stay. The park gate closes at 7 and they give you a code to get in, but the other side of the building is not gated at all. Overall, we liked this park and it's great for an overnight stop. Be aware that there is a $4.00 per person per day fee in addition to the camping fees, which for us came to $30.00 per night. We camped at Lake Colorado City State Park in a Fifth Wheel. Nearest grocery store is Loews Market 7-8 miles away. Diesel is very high in the area, averaging $3.15 per gallon. We went to Matlock Enterprises and paid $2.86 per gallon (they also refill propane). There's nothing to do in the area, and the town itself is pretty run down. This campground is remote, quiet and very pleasant. Lots of cactus, mesquite, cedar and rabbits. Dark nights make for excellent star gazing. Lake level was somewhat low. No boating or fishing was observed during our stay. No WIFI. If the Sisters on the Fly hadn't taken up an entire loop and part of ours, the whole park would have been nearly vacant. Our site was fairly level, hookups were convenient. We would stay here again when in the area. We camped at Lake Colorado City State Park in a Fifth Wheel. We were one of two campers that evening. Enjoyed seeing large covey of quail in our campsite. We camped at Lake Colorado City State Park in a Truck Camper. Good overnight stopping place. Quiet, only one other camper there. Nice state park, with very roomy sites. I disagree with the earlier review claiming sites 13-19 are level, as I was at 13 and it was not particularly level. With that being said, most of the sites aren't too far off level anyway. The wifi was broken due to a recent storm, with no plans to fix it. Despite being there on a beautiful weekend in April, I had the park almost to myself. Had a great stay, although pricewise, Texas parks aren't exactly a bargain. We camped at Lake Colorado City State Park in a Travel Trailer. Awesome park with plenty of room around the campsite. It is one of the nicer parks we've been to. Lot spacing is spacious with some shade. Site surface is gravel and features a fire ring and picnic table. We camped at Lake Colorado City State Park in a Fifth Wheel. Sites 13-19 are level. Ask at registration - they have a cheat sheet showing which sites are level. Sites are wide open, mesquite trees don't provide much shade, but picnic tables are covered with a shelter. Free park WiFi works, but is very slow. Restrooms were not very clean. Very quiet here, a nice setting with the lake, trees and prickly pear cactus. A few short hiking trails go around the lakeshore. Lake was very low when we visited; only kayaking was allowed. Very windy during our stay - which is probably typical for the area. We camped at Lake Colorado City State Park in a Travel Trailer. There is a grocery store in downtown Colorado City, about 6 miles away. Colorado City State Park Staff and Rangers are very friendly and accommodating. We strolled in, no reservation and picked #13 , (water & 30 amp electric hook ups) due to it being closest to trail leading down to lake, but changed our mind once we drove in to the park, I called Office and decided to change our spot to #17 where we had a beautiful view of the lake and its deep blue water. No problem! Ranger brought us our new tickets in like 15 mins to our new designated spot. Nice breeze and view, shady in picnic/patio area, fire pit in each spot. WiFi is available, slow signal in our area, middle section might have stronger signal due to that's where we were told tower was, near the restroom in middle camping area. Cactus and mesquite galore in hiking trails, be sure to wear jeans. Fishing piers are closed, due to low water level, but you can fish off of shoreline. We were informed there was good fishing by the cabin areas, where larger rocks lead down to the waters edge. in both men/women's restrooms, only complaint was that showers didn't have a curtains. We didn't mind since our Camper is equipped anyways. There were plenty of campers through out park, but you wouldn't know it since it's so spacious. Dump station on our way out made it super easy to clean our tanks before leaving. If you're looking for quiet relaxation with beautiful scenery, hiking trails and moonlight sky, then this is place for you. We camped at Lake Colorado City State Park in a Travel Trailer. Colorado City, about 6-7 miles away, to grab some much needed supplies at the Higginbotham Hardware Store in town and groceries at the Fuller Thriftway and the Family Dollar across the street from Grocery Store. Cactus and mesquite galore in hiking trails, be sure to wear jeans. We stayed for a week in a back-in site so our rate was good, you pay a premium for a pull-thru. The sites are spaced wide apart but not a lot of shrubs to help provide privacy. We got a site in Mesquite Circle and half the nights we were the only ones in sight. Not much shade to speak of either since the trees don't grow tall enough to provide any. We had a few gusty days, but the trees helped block the wind. Being here in the spring, the cacti have pretty yellow & pink flowers blooming, African daisies, and many other wildflowers are in bloom everywhere. The bath houses on the other hand are a different story. Dead bugs litter the floor everywhere, I can tell it hasn't been cleaned in weeks. There is no shower curtain or privacy door to speak of, just 2 open stalls. We work online so Verizon coverage is our key item to review, and I'm glad to report LTE data coverage gets 2-3 bars on our Mifi. 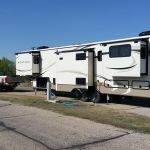 We camped at Lake Colorado City State Park in a Fifth Wheel. The town of Colorado City is 7 miles from the park. There is a grocery store, gas stations, and a couple fast food places (Sonic, Dairy Queen). We couldn't get any TV channels OTA, so we used Redbox for entertainment. There are 3 Rexbox kiosks in town. This was our second stay in this park. It's such a pretty setting. Almost no one else was there. We felt very safe. We paid $2 extra per night for a pull-through. Sites have water and electricity but no sewer. No wifi but our Verizon hotspot worked well. We camped at Lake Colorado City State Park in a Fifth Wheel. A great state park gem that has been abandoned by the local since the lake is drought stricken. If your idea of a relaxing time is no crowds, open spaces to let the kids roam while you read your book, this state park is for you. You can tell it had its heyday when the lake was accessible, but don't let that keep you away. We were glad to stumble upon it by accident and are already planning our return trip. We camped at Lake Colorado City State Park in a Fifth Wheel. We stopped in here on our way to Ruidoso NM and it's pretty much like I remembered it, dry and desolate. I really wonder why the state keeps this park open, we arrived on Saturday afternoon and there were 2 other campers in the entire park. I guess the lake being so low is keeping people away. Anyway, the site we got did have a fairly large tree on it, the staff said it was the most popular site. The sites are spread way out, ours was a pull through (#49) and fairly level side to side. Electric and water were fine. We scoped out the bathrooms and showers: they were spotless as usual. Park is very quiet. Not bad for a stopover, but it's about 6 or 7 miles off of I-20. We'll probably stay here again. We camped at Lake Colorado City State Park in a Fifth Wheel. The rangers at this park are very friendly and helpful. We practically had the whole place to our self due to the fact that the lake is so low because of the drought in the area. 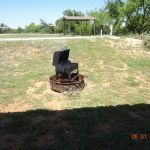 The area is typical west Texas with mesquite trees and scrub brush. The sites with water and electric hook up are easy to get to, as is the dump station. This would be a great place to use for family reunions because it has such wide open spaces and the day areas are not fully utilized. It was very peacefully and a great place to get away from it all. I will definitely return. 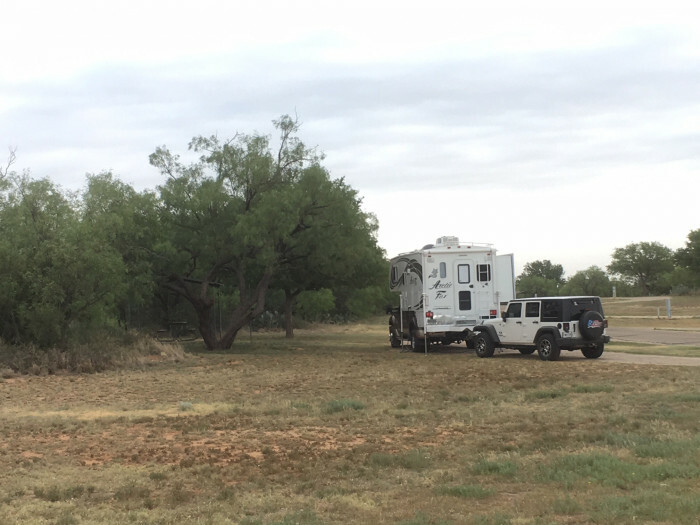 We camped at Lake Colorado City State Park in a Fifth Wheel. Are you affiliated with Lake Colorado City State Park ?